The 65PUS7601 is one of those televisions that’s a bit of a pain right up until the point when you actually sit down to watch it. The interface is clunky and the set up can be a bit of a pain, but once you get settled down in front of it, it’s a real joy to watch, with great image quality and Ambilight that continues to impress. The first thing you’re guaranteed to notice about the Philips 65PUS7601 is its Ambilight functionality. It might have been around for a few years now, but the technology, which uses an array of RGB LEDs on the television’s rear to project color onto the wall behind, is just as impressive as ever. It’s not quite as advanced as the higher-end Ambilux technology built into Philips models such as the Philips 65PUS8901, which uses projectors rather than simple LEDs to cast light onto the wall behind, but it’s an impressive effect all the same. Thankfully this television also has a lot more going on under the hood beyond its fancy projection technology. It’s 4K HDR images are absolutely stunning, and far better than their specs on paper would have you believe. The Philips 65PUS7601 has a nicely understated design that we are big fans of. It’s got appropriately thin brushed-aluminium bezels, and its two feet are of a similar finish and are sturdily constructed. All this means that although at 65-inches the TV is certainly large, it doesn’t take up any more space in your living room than it absolutely needs to. The one flourish Philips has allowed itself with the design of the television is its logo, which illuminates when the TV is on. If anything it can appear a little too bright on first glance, but thankfully you stop noticing it very quickly. It’s round the back where all the action happens, with its array of RGB LEDs which are poised to light up your wall with a dazzling array of colours. In terms of inputs the Philips 65PUS7601 has a good number of HDMI inputs, two 4K 60Hz and two 30Hz. It’s also got a range of older connectors for your legacy boxes, including SCART and component. Design TL;DR: The 65PUS7601’s nicely understated design feels sturdily constructed and sufficiently premium. It’s been said before a thousand times, but Android TV still can’t compete with the likes of Tizen and WebOS. It’s responsive enough, and getting to content gets easier with time as apps that you’ve recently used will find themselves placed at the top of your menus. But the lack of support for some of the biggest streaming services in the UK (All 4 and ITV Hub) is frustrating, and its insistence on filling your homescreen up with recommendations is annoying and gets in the way. The TV’s remote is both a blessing and a curse when paired with Android TV. The full QWERTY keyboard that can be found on its rear is much easier to use to enter text than an on-screen keyboard, but certain apps (such as Amazon Prime Video) choose to offer their own on-screen keyboards rather than using the system version, making the remote’s keyboard useless. We found the remote’s directional pad frustrating to use. It’s part button, part touch-pad, and frequently these two functions conflict. You’ll try to press the centre of the pad, but it’ll register it as a swipe to the right, or else you’ll try to click to go to the left, and have that register in addition to a swipe. Smart TV TL;DR: The 65PUS7601 isn’t the worst Android TV implementation out there, but the interface continues to frustrate despite the feature-packed remote. Despite the fact that 2016 has seen huge swathes of content beginning to be released in proper native 4K with all the HDR bells and whistles that entails, the fact remains that for the time being at least you’re likely to spend the majority of your time with a 4K TV watching standard Full HD, standard dynamic range content. Thankfully the Philips 65PUS7601 does a decent enough job of upscaling and sharpening up your existing content. It’s not quite on the same level as native 4K content, but it doesn’t feel stuck in the past either. Philips calls this functionality its ‘Perfect Pixel Ultra HD’ technology, and it works very well. You’ll have to fiddle with the settings a little to find the right balance between sharpness and unnecessary picture noise introduced by over-aggressive upscaling, but once you’ve got it set up (which is more frustrating than it needs to be on account of the directional buttons on the remote) you should be ready to enjoy a great level of image quality. HD/SDR TL;DR: Upscales Full HD content well, but be prepared to fiddle with the TV’s settings for a while to find the right sweet spot. Of course the set truly shines when you give it some meaty 4K content to get its teeth into, at which point it performs magnificently. On paper that shouldn’t be the case. Philips TVs don’t currently meet the Ultra HD Premium specification; their maximum brightness is limited to just 700 nits of brightness when 1000 nits is the level required for ‘full’ HDR, and the 65PUS7601 covers just 76% of DCI-P3 colour spectrum, versus an ideal of 90%. But when you sit down to watch the television itself, none of those specs seem to matter. A lot of this has to do with the television’s 128 zone backlighting system, which does a great job at increasing brightness in the parts of the image where it’s needed, while keeping blacker parts of the image as dark as possible. It’s not as flawless as the higher-end OLED panels on the market, and there’s a slight amount of haloing visible closer to the screen’s edge with especially bright image portions when they’re next to complete blackness, but this is rarely visible when viewing content directly, and is mostly apparent in menus and other user interfaces. Colours are rich and vibrant, and the set handles motion with a confident authority. The opening fight sequence at the beginning of The Revenant (played from an Ultra HD Blu-ray disc on an Xbox One S) is a fantastic means of showing what the set is capable of. The numerous panning shots in the sequence are helped by the minimal amount of motion-smoothing it’s possible to enable, which is able to smooth without feeling weird and artificial. Considering the quality of the source, image detail was always going to be good, but what the 65PUS7601 manages is still remarkable, with images that have great depth and clarity to them. The one criticism we have is that the lack of the full 1000 nits of peak brightness means that the parts of the image that you’d expect to be especially bright (like a small glint of sunlight reflecting off a ripple of water) don’t quite have that same sparkle to them. But regardless, the overall standard of the image quality is solid, and we’d have no qualms recommending this television in those terms. Immersion is also helped by the Ambilight system, which really helps to draw you into the image. One use case that surprised us occurred when playing the recently-released Battlefield 1. Every time we looked down the sight of a sniper rifle, the entire colour of our wall changed, which felt incredibly immersive. 4K/HDR TL;DR: It might not look it on paper, but the 65PUS7601 offers a simply stunning level of image quality, with vibrant colours, great detail, and excellent motion. It’s become something of a bugbear of flat-screen televisions - they just don’t have enough space to dedicate to speakers to be able to achieve a decent level of sound performance. Thankfully the Philips 65PUS7601 has a couple of tricks up its sleeve to allow it to produce a full-bodied sound without compromising on its sleek exterior. As well as offering support for DTS Premium Sound, the TV has a subwoofer based on the company’s ‘Double Ring’ technology. The takeaway is that the television’s sound is nice and punchy, and has weight when required. There’s a good amount of detail across low, mid and high-frequencies, and the sound is nicely crisp. Sound TL;DR: Reassuringly, the 65PUS7601 provides a great level of sound quality, making a soundbar an optional, rather than a recommended, upgrade. The Philips 65PUS7601’s price point is a competitive one for 4K televisions, meaning you’ll have plenty of choice if you want to look at other models. 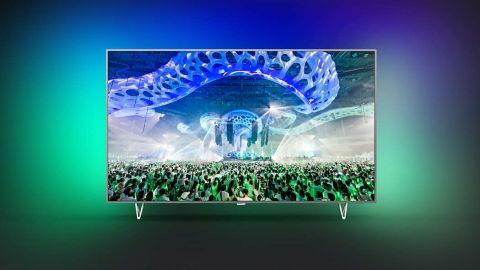 The Panasonic TX-65DX902B is very similarly priced and offers a very similar experience to the Philips and its operating system is Firefox OS, which we consider to be a far superior operating system to Android TV. If you’re willing to sacrifice Ambilight, this might just be the TV for you. At the same price it’s possible to make the jump to OLED, and the LG OLED55E6V is a great choice. You’ll have to take a step down to 55-inches, but if you’re prepared to pay a little more, the 65-inch LG OLED65E6V is a stunning set, with deep blacks that OLED television’s are especially good at providing. Finally, a great budget option is the 60-inch Samsung UE60KS7000, which is a brilliant set, and is also excellent at upscaling SDR to HDR content using its HDR+ technology. However its edge-lit LCD display doesn’t quite offer the same HDR performance as the Philips. For a full list of our pick of the competition, check out our full guide to the best 4K TVs. You might be drawn towards the Philips 65PUS7601 because of its beautiful Ambilight projection, but behind this feature lies a very capable television. Ultra HD content looks suitably fantastic, and with a little bit of tweaking, you can get older Full HD content looking almost as good, with colour and detail levels that really pop. Don’t believe the paper specs, because the 65PUS7601 far exceeds them. Yes, HDR might not quite reach the blinding brightness of the UHD Premium spec, but when its image quality is this capable, it’s unlikely to concern you as a viewer.